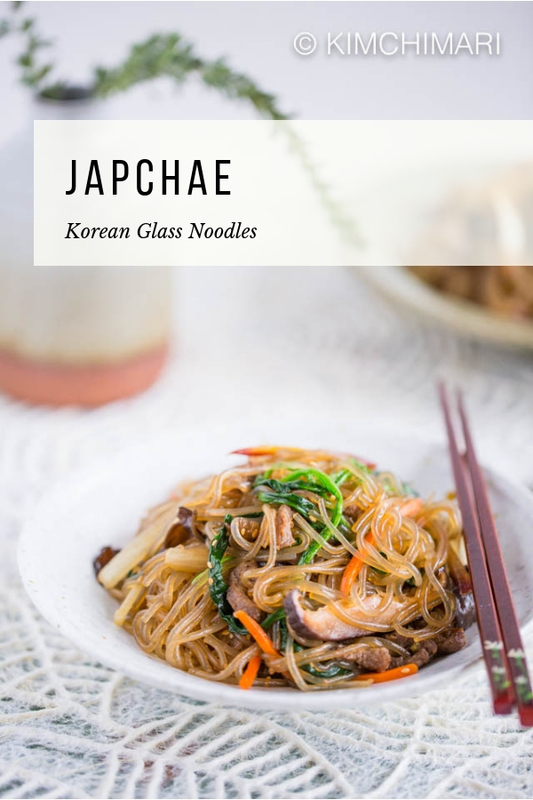 Japchae is a classic Korean Glass Noodle dish that is served as a side dish or appetizer. Mild in flavor, this is a great first dish to try if you never had Korean food before. This Japchae recipe is traditional and authentic – exactly how my family made it for years, so Enjoy! Japchae is a very popular Korean glass noodle side dish that’s made with vegetables and also sometimes meat. If you have ever been to a Korean restaurant, chances are you probably have had Japchae(잡채). And if side dish was the only way you had it (as opposed to an a la carte item)- then I’m afraid you probably had a very poorly made japchae. It sometimes makes me mad when I see restaurants serve this most delicious Korean glass noodle dish as a side dish that’s missing the authentic ingredients and flavor. Probably it’s 98% noodles and then maybe some little specks of vegetables once in a blue moon and no evidence of beef anywhere. Either that or it’s been reheated so many times that it has just morphed into something else. Jap(잡雜) means to mix and Chae(채菜) means ‘vegetables’. Historical records go back as far as 17th century Joseon Dynasty when it was first served to the King Kwanghaekun. Interestingly, there were no noodles in the earlier versions and the glass noodles only appeared in this dish in 1919 when a Dangmyeon 당면 (Glass Noodles/Potato Starch Noodles) factory first appeared in the Hwanghae region of Northern Korea. There’s a story that I’m reminded of every time I try to explain Japchae to someone. You see.. my father was a diplomat and he had a very good friend who was the US Ambassador (Mr. Walker) to Korea in the early 80’s. We had dinner together at a Korean restaurant in DC one time (I think it was actually Wooraeok), and the ambassador said that he loved Japchae (or as he called it ‘ChopChoi’) and wanted to order it. And then he said “Do you know how I memorized the name of this dish?? It’s the “execute” = “chop” Mr. Chae (or choi) dish! !” HAHAHA..I thought it was a bit bizarre but also hilarious and very ingenious of him…😂🤣and so the story has always stuck with me ever since. BTW, the ‘chop’ 잡 can be pronounced as somewhere between Job and Chop. 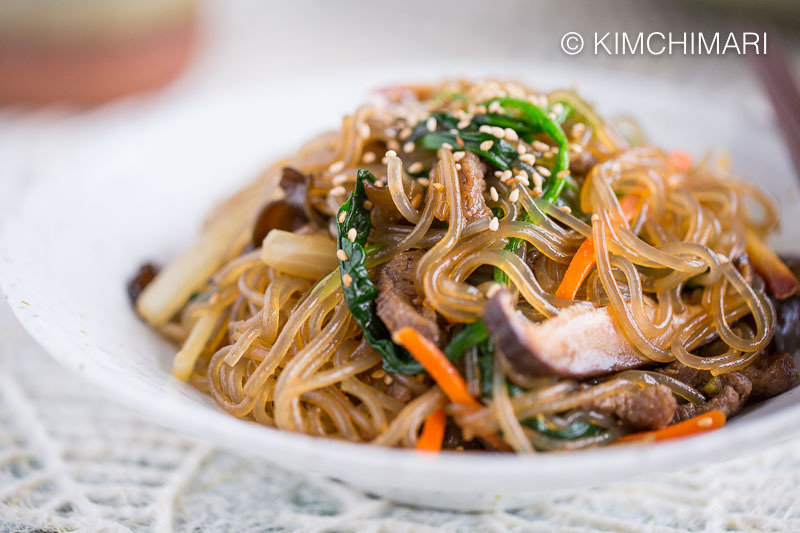 The Japchae recipe I introduce here is the way my mom used to make at home when I was little – for the Seollal or Chuseok holidays and big parties. I know there are different ways of making Japchae but the authentic and traditional way to make Japchae is to saute and season all ingredients separately (I know it’s kind of a pain) and then mix it all together at the end. Because this can be quite time-consuming, many recipes you see today may tell you to saute all the ingredients all together at the same time. 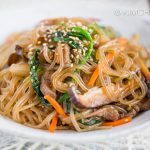 And in my opinion, unless done right (which I actually have found a way to make it right – see my One Pan Japchae recipe for quicker version), it usually produces a mediocre one where everything is soggy, mushy and wet. 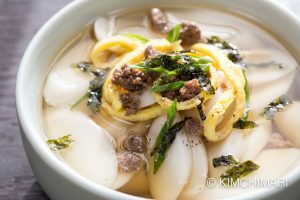 What is Dangmyeon (Korean Glass Noodles) and what brand should I buy? Dangmyeon is a dried noodle made from 100% sweet potato so it’s a great gluten-free food. It is quite chewy and is also low in calories (90 calories per 1 oz). I have not found a lot of difference between the brands so just buy a reputable brand and that should be fine. Is Japchae served HOT or COLD? Japchae is best served at room temperature but t can be served warm too. 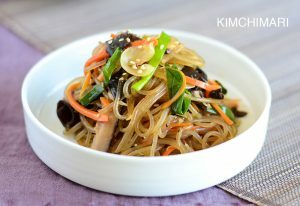 Japchae can be stored at cool room temperature for up to a day. That’s kind of hard to answer simply. 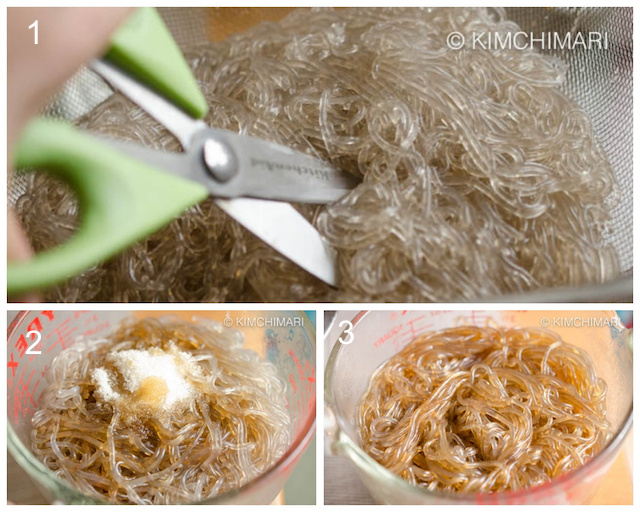 Dangmyeon (Glass Noodles) itself is pretty high in carb as it is made from sweet potato starch. But all the other ingredients (vegetables and beef) are almost zero carb. So my nutrition facts of my recipe say the Japchae carb is around 23 g per serving which is not high but not low either. You can make it low carb by reducing the amount of noodles and adding more vegetables and meat. And using less sugar or use a sugar substitute. How do you reheat Japchae? Reheat in a non-stick frying pan over medium-low heat, stirring often. You can also microwave but I prefer the pan method. How long does Japchae keep in the fridge? It can be stored in the fridge up to a few days or can also be frozen. How should I store Japchae? Japchae will spoil if left at room temp longer than half a day in warmer temperatures (summer) so store in fridge right away. Seasoning Japchae – Glass noodles absorbs the seasoning well which means it may taste bland after some time after you season it. So it is best to taste 2-3 times after it is made to make sure it tastes good at time of serving. So taste it right after, maybe another time after letting it sit for an hour and then another time right before serving. Adding little more sugar, soy sauce and sesame oil if you feel like it is missing something. 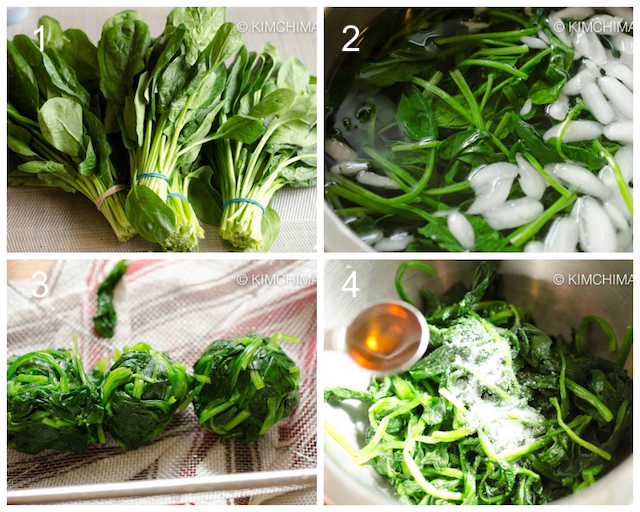 Spinach – it is best to use young tender spinach that you buy from Asian or Korean markets. Do NOT overcook the spinach when you blanch. The texture should be chewy. Mushrooms – Substitute fresh oyster mushrooms for shitake mushrooms. Wood ear mushrooms are OPTIONAL but adds a great crunch so try to get some! Pork or imitation crab meat in lieu of beef. Egg Jidan (thin pan-fried crepe-like egg) can be added on top as a garnish. 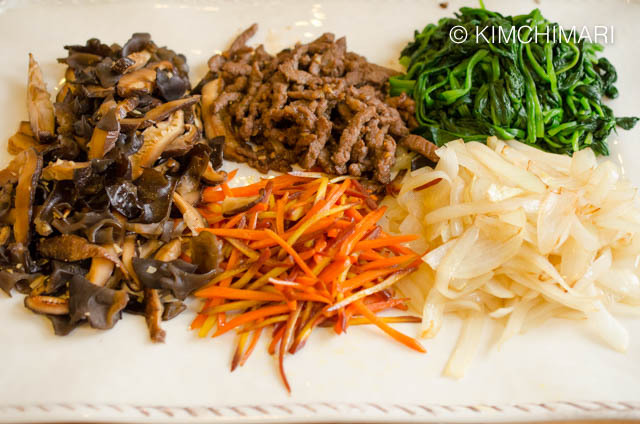 Vegan – just omit beef, see my One-Pan Japchae recipe below. Gluten Free – glass noodles are naturally gluten-free. To make it 100% gluten-free Japchae, just make sure to use a GF soy sauce like Tamari soy sauce. 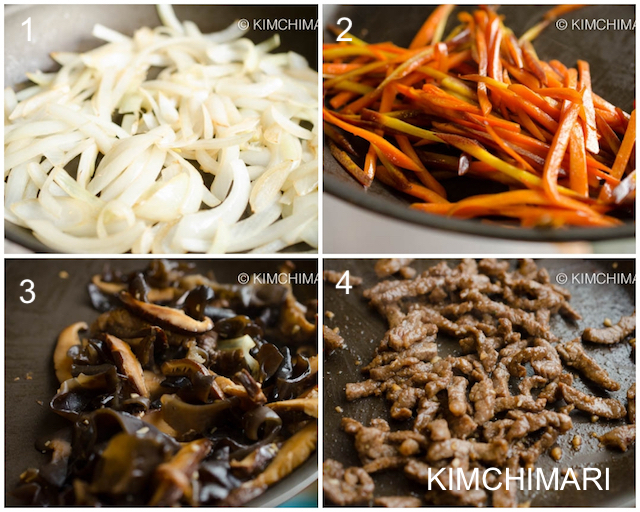 UPDATE – Here’s my one-pan Japchae recipe that I uploaded in 2016, if you want to try it. I simplified the recipe without sacrificing the flavor! Cut beef into thin strips, against the grain. 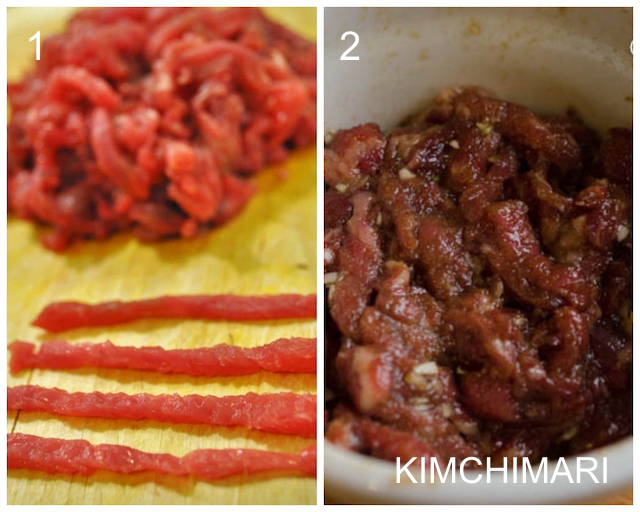 If you want an easy way out, you can also use bulgogi meat cut into smaller pieces. Mix the beef marinade in a bowl big enough to hold the beef. Add the beef, massage it with your hands and let it sit for a few minutes while you prepare the vegetables. I used garlic powder here because the garlic flavor doesn’t need to be very strong in this dish but you can certainly use fresh garlic if you prefer. Boil 8-10 C of water in a pot and boil the dangmyeon (glass noodles) according to package instructions (usually 6-8 min) or until the noodles become clear and is soft all the way to the center of the noodle. More water is better than too little since the glass noodles soak quite a bit of water. Once the noodles are cooked, drain. While noodles are still warm, season with soy sauce, sugar and sesame oil. Cut noodles with scissors a few times so they are easier to eat. Coating the noodles with oil will keep the noodles from sticking together. Wash spinach. Boil another pot of salted water (6 C or so + 1 tsp salt) and quickly blanch them. Do not over cook the spinach – probably no more than 40 seconds. Spinach should be still a bit chewy and not too mushy. Shock the cooked spinach in cold or ice water to stop the cooking process. Drain the water and squeeze out any excess water from the spinach by squeezing them gently between your hands, forming a ball. Season blanched spinach with some salt and sesame oil. Set aside. 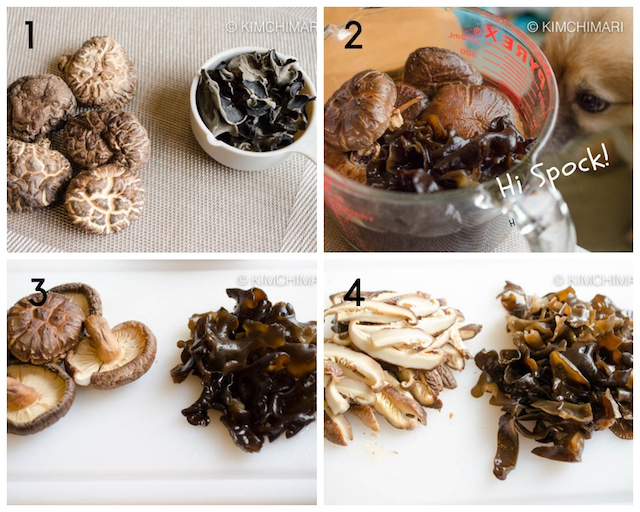 Soak dried shitake mushrooms (left) and wood ear mushrooms (on the right in top left pic #1). Rehydrate mushrooms in warm water until they are fully soft (about 20 min). To speed things up, soak them in hot water. Clean soaked mushrooms under water. Sometimes dirt/sand are buried in the mushroom to make sure all the dirt is washed off. You can also cut off the ends that have the dirt. Cut shitake mushrooms into thin strips. Cut wood ear mushrooms into rough wider strips. Set aside. 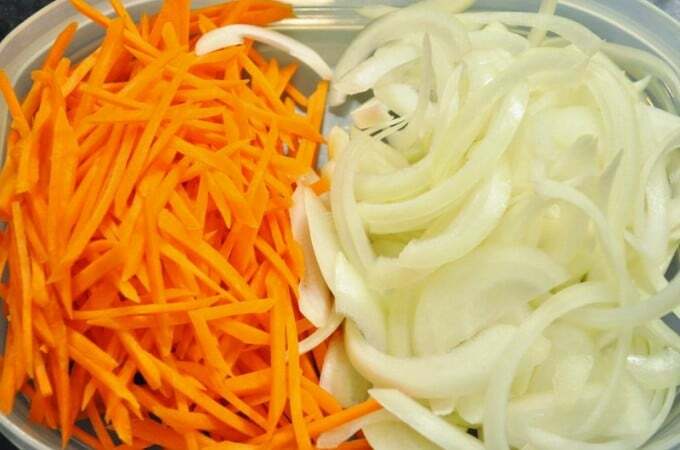 Julienne carrots and onions and set aside. SAUTE INGREDIENTS – Saute each of the ingredients separately and let them cool. You can save yourself the trouble of washing pans in between by using one frying pan and sauteing ingredients one by one in the following order: onions -> carrots -> mushrooms -> beef. Just wipe off any excess oil and crumbs with a paper towel after cooking each ingredient and you should be good to go. Add 1 T oil in frying pan on medium heat. Add onions and sprinkle a pinch of salt. Saute until onions become transparent but not brown. Add 1/2 T oil in frying pan on medium-high heat. Saute the beef until they are fully cooked. If there are any extra juices in the pan, cook a little more until it’s evaporated. Transfer each of the onions, carrots, mushrooms and beef to a plate and let them cool. It’s time to put everything together! Add all the cooked vegetables and beef to the noodles and mix them all together. And because it is a lot of work, when I make it for our dinners, I usually have this as our main dish with some rice and maybe some soup or jjigae. You can also FOLLOW ME on FACEBOOK, PINTEREST and INSTAGRAM or join my FACEBOOK GROUP to see other Korean recipes to ask and share everything about Korean food with others just like you! 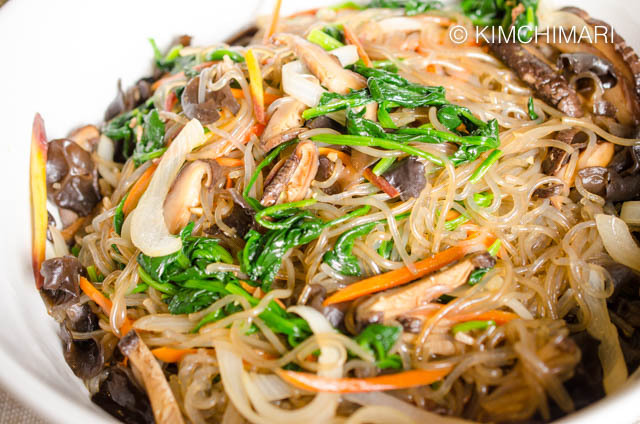 Japchae is a classic Korean Glass Noodle dish that has beef, carrots, spinach, mushrooms and onions. Great dish to serve at dinner parties or pot luck. 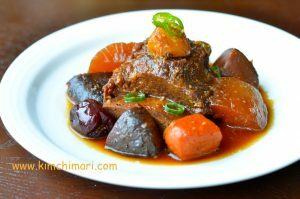 Omit beef for a wonderful vegan version. Cut beef into thin strips, against the grain. Make beef marinade in a large bowl. Add the beef, mix and let it sit for a few minutes. Boil 8-10 C of water in a pot and cook the dangmyeon according to package instructions(e.g.6 min) or until the noodles become clear and is soft all the way to the center of the noodle. Drain cooked noodles. While noodles are still warm, season with soy sauce, sugar and sesame oil. Cut the noodles with scissors a few times. Boil salted water (6 C water + 1 tsp salt). Quickly blanch spinach in boiling salted water. Do not cook the spinach more than 40 seconds. Spinach should be still a bit chewy and not too mushy. Shock cooked spinach in cold or ice water, drain and squeeze gently to remove excess water. Season the blanched spinach with some salt (1/2 tsp) and sesame oil (1 tsp). Set aside. If using dried shitake and/or wood ear mushrooms: soak them in some warm water for 10-20 min or so until they are fully hydrated. Clean the fresh or rehydrated mushrooms by rubbing each mushroom under cold running water. Cut shitake mushrooms into thin strips. Cut wood ear mushrooms into wide strips. Set aside. Saute each of the ingredients separately and let them cool. Saute ingredients one by one in the following order: onions -> carrots -> mushrooms -> beef. Just wipe off any excess oil and crumbs with a paper towel after cooking each ingredient and you should be good to go! - Add 1 T oil in same pan. Add carrots and a pinch of salt. Saute carrots until they are soft and tender. remove. - Add 1 T oil. Add mushrooms and a pinch of salt. Saute for 3 mins or so and the mushrooms should be done. - Add 1/2 T oil in frying pan on medium-high heat. Saute the beef until they are fully cooked. If there are any extra juices in the pan, cook a little more until it's evaporated. Add all the cooked vegetables and beef to the noodles and mix them altogether. Sprinkle some toasted sesame seeds. Adjust the seasoning with more soy sauce and sugar as needed. Unless you like things really bland, it will taste much better if you add more soy sauce, (1~2 Tbsp), sugar (1~2 tsp) and sesame oil (1 Tbsp) as the final finishing touch. Amount is based on 200g dangmyeon. ** I say 10 servings but this is small serving as a side dish. If you want this to be your main dish, this would probably serve more like 5~6 people. 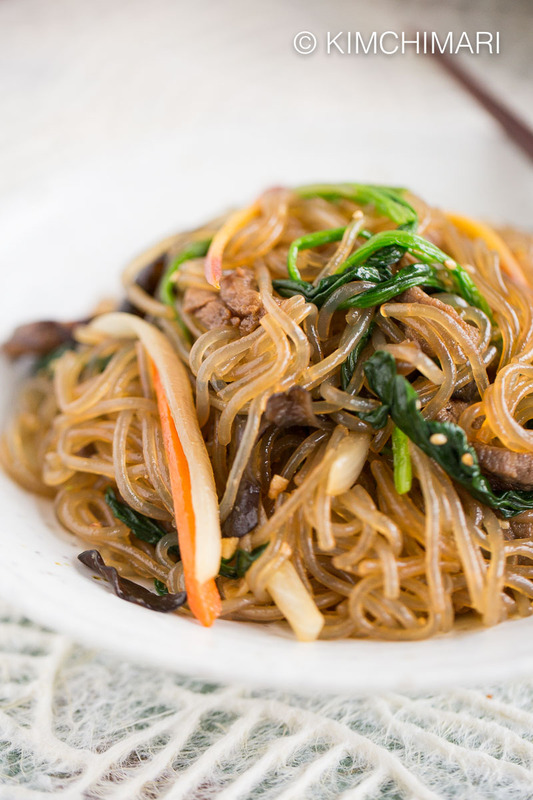 Seasoning Japchae - Glass noodles may taste bland after some time after you season it. So it is best to taste again afterward. Adding little more sugar, soy sauce and sesame oil if you feel like it is missing something. Serving and Storing - Japchae is best served at room temperature but t can be served warm too. Japchae will spoil if left out longer than half a day in warmer temperatures (summer) so store in the fridge right away. It can be stored in the fridge up to a few days or can also be frozen. Reheat in a non-stick frying pan over medium-low heat, stirring often. Egg Jidan (thin pan-fried crepe-like egg sheet) can be added on top as a garnish. Vegan - just omit beef, see my One-Pan Japchae recipe below. Gluten Free - glass noodles are naturally gluten-free. To make it 100% gluten-free Japchae, just make sure to use a GF soy sauce like Tamari soy sauce. Substitute fresh oyster mushrooms for wood ear mushrooms. Wood ear mushroom is OPTIONAL although it really does add wonderful crunchy texture. I first made jap chae for our church potluck about two years ago, it was a hit and i bring jap chae to our potlucks every time since because they ask me to (saves me time to think about what to bring). I also bring some extra seasoning for the noodles served on the side and some fried egg sheets for topping. My husband thinks day old japchae reheated and reseasoned tastes much better. Thanks for your more detailed instructions. Hi Mercy, thank you for taking the time to leave me this comment! Bringing extra seasoning on the side is a great idea!! Yes, reheated Japchae is great – I know. Enjoy!! Aww.. thank you so much for your kind feedback. I really appreciate it. Have a great day!! You’ll be pleased to know that I made this for myself on New Year’s Day – a few days ago. Still excellent – but I never add enough salt! I was planning to make it for Western New Year’s, because I have all the ingredients at home all the time and I found some lovely spinach at the Mexican market, but when I started it turned out that I had used the last of the noodles and hadn’t replaced it. 🙁 So a trip to Smile market last week fixed that! I’m planning to make Tteokguk tomorrow, nut I’m out of spinach, so I’ll be garnishing with chard from the garden. No shortage of eggs here! Happy New Year! Hi Judith! Yes, good for you for making this for New Year’s and yup, the noodles just soak up the seasoning so fast, it just keeps disappearing..And chard instead of spinach, sounds very interesting. You can also use green onions instead. I really enjoyed your eggs – I cherished it till the last one. Hope the girls are doing well..A very Happy New Year to you Judith! Hope I can visit soon but looks like my plate is full for the next couple months..sigh..take care. What do you mean by T? Is it tbsp. tsp, etc.? Thanks! Hi. Yes, T = Tbsp. I edited the page just to make it clear. Thanks for asking! Yup! That’s certainly smart idea! We end up having rice in addition anyway but you are right, no need to have rice. Totally a good meal on its own. Thanks so much for sharing! Can the leftover be stored in the freezer? Yes, it can be stored in the freezer. Just reheat in a pan over low heat – not too high. Enjoy! I love your recipes on Kimchimari! I have made this before without the meat, and it turned out perfect! Sautéing the ingredients separately really makes a difference in the final product. Tonight, I’m making it w/ pork shoulder for my husband and daughter. I love Korean food, and your recipes make it accessible and easy to make at home for non-Koreans. Thank you! I’m so HAPPY to hear that!! Yes, sautéing separately really does make a difference doesn’t it? So few people do it this way now.. 🙁 Thank you SO much for your comment – it is always so encouraging to hear. Have a great day! Thank you this is detailed and clear for me to follow through. Glad to hear that!! Good luck – hope it turns out yummy for you! Can’t wait to try this! What kind of soya sauce would you recommend? You can use Kikkoman soy sauce which is widely available in any super market or any Korean dark soy sauce.See my On K Ingredients page. Hope it turns out good!! Thanks for stopping by. Hi, it’s my first time visiting this site and I’m in love with Korean culture, when it comes to Korean food I’m goin’ crazy over it lol! Question – if I can’t get glass noodles, can I use soy noodles? They realy looking like sweet-potato ones, but I’m not sure what’s the difference, please advise. Thank you. Hi! So glad you found my site! And sorry for the late reply – been traveling a bit..I’m not sure about soy noodles – the ones I know are opaque looking and has a different texture than glass noodles. Not as chewy and stringy but more pasty. It’s really hard to suggest a substitute…because chopchae is all about the texture of the noodles. If you want to get the taste but not the texture, you can substitute enoki mushrooms/bean sprouts/sliced burdock roots instead of noodles. For burdock roots, cook it first with some soy sauce, sugar and mirin before mixing with the rest of vegetables and meat. Good luck! Thank you!! Hope it turns out good for you! ah~ this is absolutely possitively my favorite korean dish! When I first came to korea.. if I was haveing a hard time reading the menu this would also be my go-to dish because I knew it would be delicous.! Two of my friends in Yeoson (?) have offered to teach me to make it but that willl be a long time from now so again thank you 감사합니다! Do you know what the purple-ish jelly like ingredent that it in 잡채 ? maybe it’s the mushroom ear wood ?? ? Hhmm… not sure what the purple-ish jelly like ingredient is..it could be the mushroom. I’m not sure though.. Yes, people add bell peppers, different kinds of mushrooms, chives…Good luck! Thanks for stopping by. I am pretty sure the purple-ish jelly like ingredient is the wood ear mushroom. I am a Korean-American who rarely eats Korean food. Last night I was at a Korean banquet where ChopChae was served. In it, I liked what I would say more Jelly-fish-like dark purple chewy stuff, which is identified as a Korean mushroom. I got re-acquainted with ChopChae and am going to make it at home. Thank you JinJoo for sharing your recipes. The best to you and your web site.